The journey of love and marriage is filled with many milestones, festivities and celebrations. 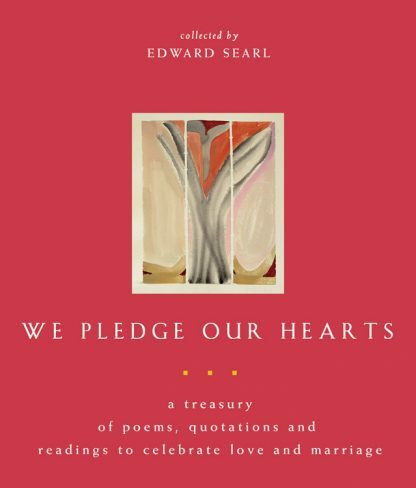 In We Pledge Our Hearts, Unitarian Universalist minister Edward Searl has collected poetry and prose marking the many stages of love: dating and courtship, marriage and commitment, friendship and companionship. This enduring volume contains selections from ancient and modern sources, from the famous to the obscure, and from many cultures and faith traditions. Some works are previously uncollected. We Pledge Our Hearts is an invaluable resource for engagements and bridal showers, weddings and commitment ceremonies, and anniversaries and vow renewals. It is perfect for crafting memorable wedding toasts, speeches and vows; adding a personal touch to announcements, invitations and thank-you notes, and finding the ideal inscription for rings. This timeless tribute to love and commitment is also the ideal gift -- a wonderful keepsake for couples of all ages. Edward Searl has been a Unitarian Universalist minister in the Chicago area for more than 25 years. He is the author of two books, In Memoriam: A Guide to Modern Funeral and Memorial Services and A Place of Your Own. He is also the editor of a four-volume series forthcoming from Skinner House Books in which Bless This Child and Beyond Absence are included.